Working abroad can be both exciting and challenging! It comes with new people, unfamiliar customs and different business cultures. 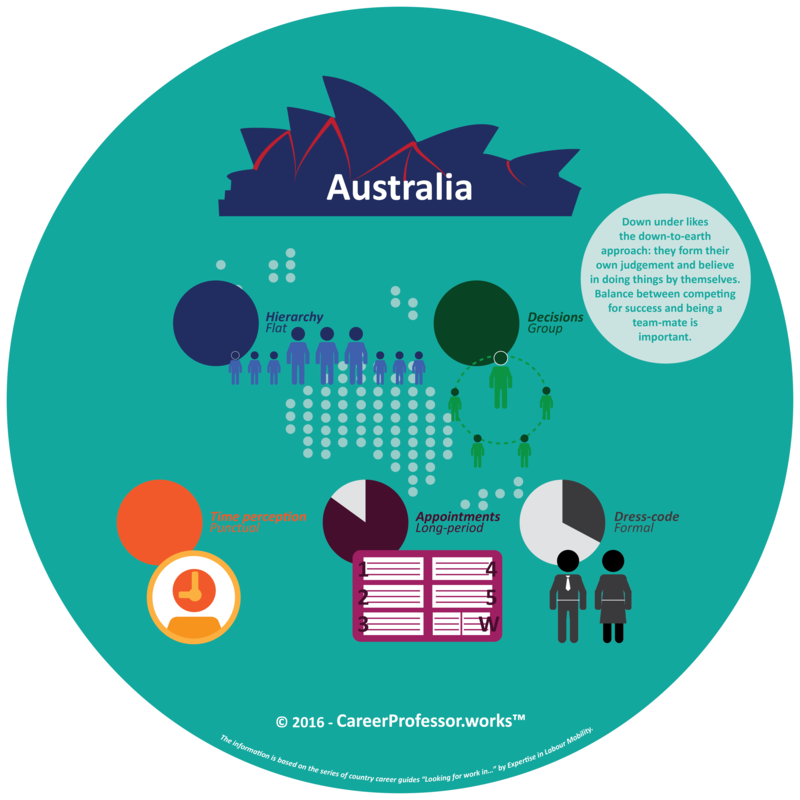 This series of CareerProfessor infographics depics a few work/life aspects of countries you should consider before making a move. 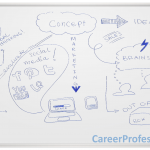 First stop in the series – work culture in Australia! Below you will find the legend with the explanation of the aspects we’re going to look at, followed by an overview of Australian business etiquette. Australia sees itself as a classless society which is reflected in the flat structure of organisations. Even though authority of the managerial positions is recognised, Australian bosses are expected to be approachable and to “get their hands dirty”. Modesty and equality are appreciated, therefore, it is rare to see displays of power and rank, and you will quickly be on a first name basis with the Australians. Team orientation is strongly developed in Australia. Although the final decisions rest on the shoulders of senior management, all specialists are consulted in advance for the best results. During meetings, communication is rather direct but good-humoured, and personal opinions as well as discussions are found useful. If you want to make a good impression on your Australian counterparts, make sure you arrive 15 min early to the business meeting. Punctuality is taken seriously and you should account for any delays. The ease of making an appointment in Australia depends on your personal contacts, so never pass on the opportunity to get introduced. In general, however, it is customary to schedule a meeting two to three weeks in advance and to confirm it closer to the date. Weather is a huge factor in the Australian business attire. Even though it can be less formal on a regular office day, certain positions and formal occasions, such as meetings and business lunches, require formal clothing even in the heat of summer! 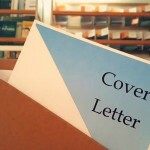 * The information is based on the series of country career guides “Looking for work in…” by Expertise in Labour Mobility.